For those of you with a passion for the arts, the Dukes Theatre offers quality and breath taking productions all year round. There are many other concerts, events and festivals over the coming months. Lancaster Tourism Information Centre now offers portable guides to parts of the City Centre. These Guides will tell you the history of the major buildings, give you the opening hours, tell you about accessibility, fill you in on background information, and offer general information about the surrounding area. The University of Lancaster, is only a short drive from the cottages, making Lodge View the ideal place to stay for a short break while visiting children and friends at the University. There is so much to offer in this area, your visit will turn into a great holiday. The recent Riverside project, costing £4.2 million now offers the Millennium Park and Bridge, stretching across the Lune River providing a pleasant pedestrian crossing point. The project has also improved many areas along the riverside walk. Williamson Park is a tranquil place to wander through While admiring the beautiful trees, shrubs and flowers. The park houses the Ashton memorial which can be seen on the skyline from miles around. The memorial houses exhibitions and viewing galleries. A butterfly house can also be visited within the park. The City of Lancaster is less than 4 miles away from the cottages. It offers a stunning location, set on the fringes of Morecambe Bay and is surrounded by the upland splendour of the Forest of Bowland, the Lune Valley and the Lake District fells. Where else can you find this exciting combination of City, Coast and Countryside? Whether your interests lie in sport, leisure, cultural events or the arts, you will find something on offer for you in the areas surrounding Lodge View Cottages. Lancaster is full of history. You can visit the castle, the priory, one of the museums, or simply enjoy the wide range of shops, markets and cafes. 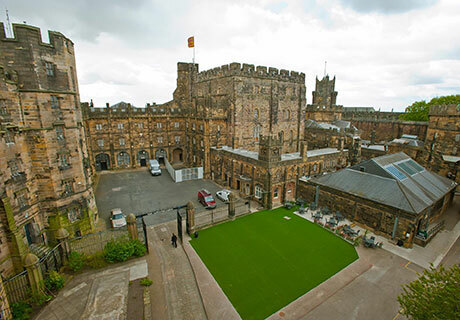 Lancaster Castle holds guided tours from Easter until late autumn. They also offer special Halloween tours for those not afraid of what goes bump in the night. 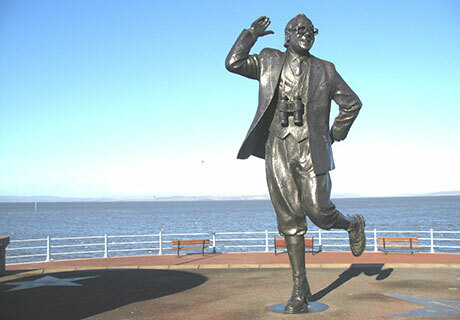 The seaside resort of Morecambe is only 8 miles from the cottages. The redesigned seafront promenade has led to the popularity of this resort soaring in recent years. Fireworks and spectacular sunsets can be viewed over the Bay. Morecambe houses a cinema, a Super Bowl and many nice bars and restaurants. There are also many other activities in Morecambe that will keep the whole family busy. Remember - don't forget your bucket and spade. Being in such easy reach, the Lake District is well worth a day-out. You will drive through some stunning countryside to reach your destination. The village of Bowness stands upon the shore of Lake Windermere where you can take a cruise to enjoy the surrounding beauty and stop off at other local villages such as Ambleside. Grasmere, Ullswater and Grange over Sands are all also worth a visit if you have time. So many picturesque villages within easy reach of each other. Throughout the year, across the District, there are concerts, festivals, plays, exhibitions, one-night shows, street festivals and a huge number of regular gigs in pubs and clubs. Click here to see what is on offer during your stay at lodge view. The famous Clougha Pike shelters the cottages and so is in easy reach, as are many other interesting footpaths and walks. For those keen bird watchers, there is a great selection of birds to be found in the local area. The RSPB Nature Reserve at Leighton Moss is also close by. Morecambe Bay is an internationally important feeding ground for thousands of birds, especially wading birds migrating to Africa or the Antarctic. There is also a Wildlife Discovery Centre in Milnthorpe which houses a unique mix of exotic wildlife. Local trekking and lessons can be arranged locally on request. Courts are available at only a 5-minute walk from the cottages. Fishing can be found at Redwells Fisheries in Carnforth, or you can play golf and go fly-fishing at the nearby Forrest Hills complex. For general sports visit Salt Ayre sports, swimming and leisure centre, which is conveniently situated between Morecambe and Lancaster. The University of Lancaster also offers an excellent leisure complex with a wide range of activities available. If you would like to know more then please don't hesitate to send an email through our contact us page or call us direct on 07894 594 448. 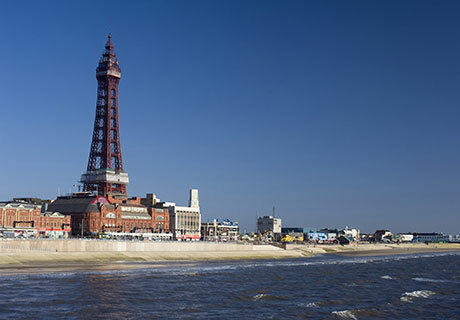 The seaside resort of Blackpool is famous for its Pleasurebeach, tower, and illuminations. Take a ride through the town by horse and carriage, and sample great fish and chips at the famous Harry Ramsdens restaurant.